Born in Munich, violinist Viviane Hagner has won exceptional praise for her highly intelligent musicality and passionate artistry. Ms. Hagner performs with "poise and magnificent assurance" (The Times/London) and "an almost hauntingly masterful display of technique and artistry" (Washington Post). As a musician of tremendous depth and integrity, Ms. Hagner has championed new works by Unsuk Chin and Simon Holt, while breathing new life into a diverse and vast range of repertoire. Bringing her own unique sensibility to performances, she has proven herself an artist of effortless virtuosity on the stages of the greatest concert halls in the world. Her engagements and reengagements continue to highlight her demand as orchestral soloist, recitalist and chamber music collaborator. Since making her international debut at the age of 12 - and a year later participating in the legendary joint concert of the Israel and Berlin Philharmonics, conducted by Zubin Mehta - Viviane Hagner has become known for her substantial and beautiful sound as well as her thoughtful interpretations. She has appeared with the world's great orchestras, including the Berlin Philharmonic, Boston Symphony, New York Philharmonic, Cleveland Orchestra, Chicago Symphony Orchestra, Leipzig Gewandhaus, Pittsburgh Symphony, Orpheus Chamber Orchestra, Munich Philharmonic and Philharmonia, in partnership with conductors such as Claudio Abbado, Vladimir Ashkenazy, Daniel Barenboim, Ricardo Chailly, Pinchas Zukerman, Esa-Pekka Salonen, Christoph Eschenbach, Kent Nagano, Andris Nelsons, and David Zinman. Recent concert highlights include performances with the Montreal and San Diego Symphonies, BBC Symphony Orchestra, Helsinki Philharmonic, Konzerthausorchester Berlin and the MDR Sinfonieorchester Leipzig, as well as repeat performances of Unsuk Chin’s Violin Concerto with Philharmonia Orchestra at the Edinburgh International Festival and Beethovenfest, Bonn; on tour she visited Korea with the Deutsche Radio Philharmonie and Spain with the Munich Chamber Orchestra and recitals in New York, Tokyo and Philadelphia. This season’s engagements include performances with the Montreal and Vancouver Symphonies, Vienna, Lahti, and Singapore Symphonies, The Royal Stockholm Philharmonic performing Unsuk Chin’s Violin Concerto, National Symphony Orchestra of Taiwan, Tonkí¼nstler Orchestra and a European tour with the Taiwan Philharmonic Orchestra (NSO) performing the Sibelius Violin Concerto as well as a mini-residency at The Colburn School in Los Angeles. 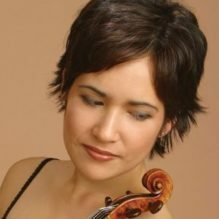 A committed chamber musician, Viviane Hagner has been a featured artist at renowned American and international festivals such as Schleswig-Holstein, Festspiele Mecklenberg-Vorpommern, Salzburg Easter Festival, Marlboro, Ravinia, Santa Fe, and Mostly Mozart; and has appeared at Amsterdam's Concertgebouw, Barcelona's Palau de la Musica, Berlin Konzerthaus, Köln Philharmonie, London's Wigmore and Queen Elizabeth Halls and New York's 92nd Street Y series. As well as bringing insight and virtuosity to the core concerto repertoire, Viviane Hagner is an ardent advocate of new, neglected and undiscovered music. Composers whose work she champions include Sofia Gubaidulina, Karl Amadeus Hartmann and Witold Lutoslawski. In 2002 she gave the world premiere of Unsuk Chin's Violin Concerto with the Deutsche Sinfonie-Orchester Berlin and Kent Nagano, later playing the work in the United States - an event which prompted The San Francisco Chronicle to rave her performance was "vibrant, warm-toned and jaw-droppingly precise [and] may well be unimprovable." After her 2006 premiere of Simon Holt's new Violin Concerto with the BBC Symphony Orchestra led by Jonathan Nott, The Sunday Times critic remarked she "caught the music's soul." The Hyperion label has issued her performances of the Vieuxtemps Violin Concerti 4 & 5 and the Canadian company Analekta has recently released her recording of Unsuk Chin's Violin Concerto with Kent Nagano and the Orchestra Symphonique de Montréal. Her first solo recording on the Altara label features works by Bartók, Hartmann and Bach. Ms. Hagner was a 2000 winner of the Young Concert Artists International auditions and in 2004 was awarded the Borletti-Buitoni Trust Award.